As we remember the life and legacy of Charles W. Colson, we've collected here a few items of remembrance, including some of the many times Mr. Colson intersected with FRC. 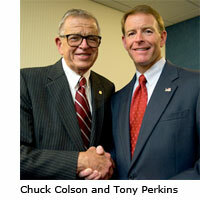 First, Tony Perkins remembers Colson along with other leaders as a part of National Review Online's symposium. FRC's Rob Schwarzwalder, Bob Morrison, and Chris Marlink all weigh in here at this blog.